The Creative Store Australia | Great Jobs. Great People. Copyright might sound like fancy lawyers and big business, but its impact is real for studios of all sizes, says Eric Schrijver. The designer and author shares his best advice for creative people on how to avoid getting into legal hot water. For designers, copyright provides both challenges and opportunities. It’s getting easier and easier to run into trouble infringing other people’s copyright — especially now that social networks such as YouTube and Facebook are starting to proactively scan uploaded content to check if videos and images are already copyrighted. On the other hand, your own copyright can be powerful leverage when negotiating with clients, publishers and anyone who wants to reproduce your work. So much of the narrative on copyright is not driven by the experience of individuals, but by the media. The role copyright plays within different creative fields can be varied, and what is useful to multi-national publishers might not be as useful to a freelancer. 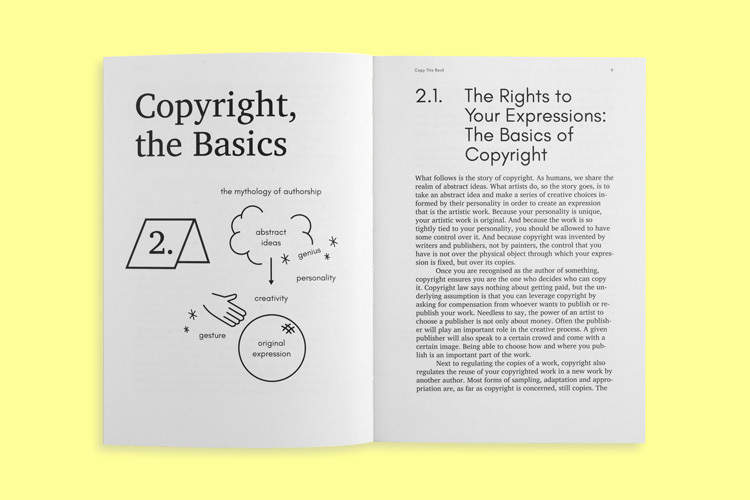 My new print publication, Copy This Book, aims to be both a practical guide for creatives, and a means with which to educate the community so they can take part in the debate as copyright law continues to change. Here are six important things that designers should know about copyright. Copyright does not require any action on your part. It’s enough just to be the author or creator of a creative work — you are attributed the copyright by default. This means that you can decide who gets to copy the work, and under what conditions. Because of unilateral treaties, most countries in the world will recognise your copyright. Of course, the inverse is true as well: if you wish to make use of the work of someone else, you can assume they have copyright – unless they died more than 70 years ago. Copyright lasts a long time! Most forms of design are sensitive to fashion and trends. While specific designs are copyrighted, the building blocks that make up their style are not. If you’ve designed a piece of furniture, a big-box store can’t start commercialising your design without your approval. However, they can copy elements of your approach, such as your use of materials and colours. Designers are free to appropriate most parts of your visual language. If you feel like other designers are imitating your style, the most rational approach is to take it as a compliment and to work hard to make sure your work is out there and visible, so you can get the credit for being ahead of the curve. When using existing photographs or illustrations, there’s no way around copyright. Designers sometimes think they can trick copyright by blurring, pixelating, distorting or otherwise stylising the images they use. That doesn’t work in the UK or in Europe: even making a drawing based on a photograph could be an infringement of copyright. You have three choices: you can work with images that are old enough to be out of copyright, you can use images that are available under a suitable Creative Commons license, or you ask the copyright holder for permission. It’s up to the copyright holder to set the conditions, such as whether you need to pay, and how much. This can be counter-intuitive, especially for your clients: when paid to make a design, the copyright stays with the designer unless they sign it over in writing. Your client can use the design only in the context it was first commissioned for. If they want another designer to adapt your design, they will need your permission first. Legally savvy clients know this and will want you to sign over copyright. This can be useful leverage when negotiating your offer: it’s good practice to bill both for labour and copyright. With smaller clients who have smaller budgets, you can instead opt to keep your copyright, explaining to them that you would prefer to be involved as a designer on subsequent iterations. Whatever you do, discuss this with the client at the start of your relationship. You won’t make any friends if you barge in with legal threats years later! Graphic designers in particular, work with a complicated tapestry of rights: a visual identity might involve the copyrights of graphic designers, type designers, photographers and copywriters. It is part of the designer’s job to understand the ways in which these rights work together. Even if your client is the one signing licensing agreements, and is legally responsible for any copyright infringement, they can still go after you for negligence if you’ve failed to caution them properly. Your client might not know that a typeface license for the desktop is not the same as one licensed for web use, or that the photographs licensed for the internal newsletter can’t be published on the company blog. Help your clients figure out the licensing and educate them when necessary. Most designers hardly see their work reproduced directly, because most design work is specific to a context and a client. If you’re an illustrator, the situation is different. Like with photographs, once illustrations circulate, chances are they get repurposed in graphic designs, on clothing or re-used in new editorial contexts. As the copyright holder, you get to decide whether you want to do something about these copies. If you’re aware of your rights, you hardly ever need a lawyer — you can just get in touch, come to an understanding, and ultimately get compensated. Particularly if the infringing party is a larger business, they will most likely know that you’re in the right—and that it’s not in their advantage to have it come to a law suit that will cost them time and money. Eric Schrijver is a Dutch designer, artist and author, who now lives in Brussels and works for Belgian tech company Acsone, where he designs and develops user interfaces. His new book, Copy This Book, has been published with help from a grant from the Cultural Industries Fund NL (Netherlands). 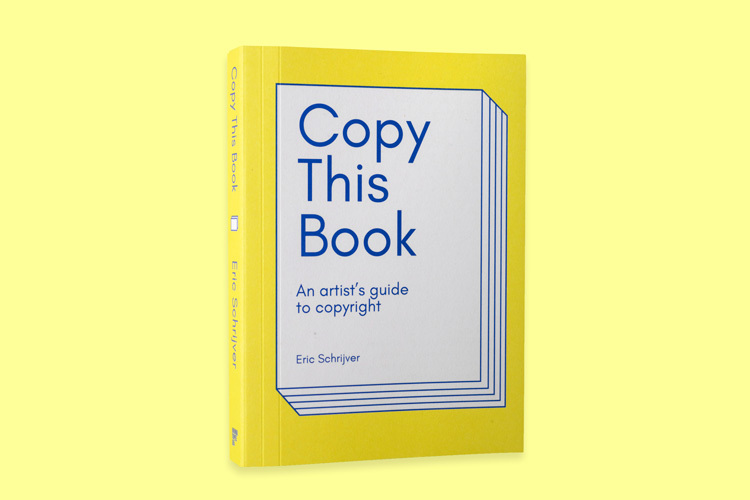 Copy This Book by Eric Schrijver is available to buy now for £17, published by Onomatopee and distributed in the UK by Antenne Books. An online edition will soon be available to buy. For more information, head here. Design in 2019 – What Will Exhibition Design Look Like? How to Step up From Senior Designer to Creative Director?